Moalboal is a peaceful beach town at the south-western part of Cebu island. It occupies the northern part of the Badian bay – where white sand beaches are surrounded by mountains covered with dense rain forests, rivers and canyons. Since Moalboal is only 3 hours drive from Cebu city, it’s possible to enjoy it as a day tour. However, you should strongly consider spending a few days there – so you get a chance to see the whole area. Moalboal is most famous for its diving and snorkeling sites, most notably Pescador island, but it’s also directly to the north of Badian – where the Kawasan Falls and Osmeña Peak are located. With so many attractions nearby, Moalboal is perfect for day tours and adventure. Our Moalboal packages include transportation and accommodation. You can choose the standard package, and we can then adjust it to be a budget package if needed. The luxury package is similar to the standard one, but your accommodation will be better, and you’ll have more time to enjoy its facilities. Every package can be booked as a group package if you’re traveling in a group of 3 and more – you’ll be able to enjoy good deals and discounts that way. The Moalboal day tour is meant for people who do want to experience some of what this place has to offer, but don’t have the time to sleep there. You can choose between the canyoneering tour, which will start as early as 08:00 a.m. (you will need to leave Cebu City at 05:00 a.m.), or combine a visit to Kawasan Falls with island-hopping/snorkeling in single day. Combining these packages with other destinations such as Oslob or Cebu city is strongly recommended. You can also visit our best vacations page in order to find full holiday itineraries that include Moalboal as well. Panagsama beach is where you’ll find most hotels – ranging from mid range beach resorts to cheaper accommodation. The beach itself is not amazing, but most resorts have a swimming pool as well. Panagsama is also the closest beach to all the nicest snorkeling and diving sites – and there are several dive resorts located there. It’s also where all the bars and restaurants are located, which makes a perfect choice for young people. Hotels in this area tend to fill up quickly, especially during high season, mostly with backpackers seeking budget accommodation – so if you wish to stay there it’s much better to book in advance. It’s important to note that while dive resorts do accept walk in guests for their diving courses – you can’t stay at the resort if you don’t plan to dive. 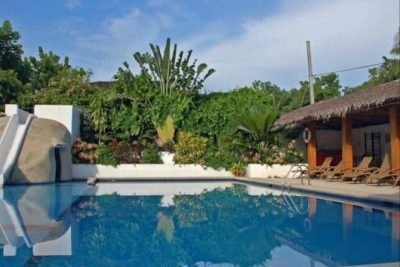 This is because they all have a very limited amount of available rooms, and they prefer to keep these for people who came to Moalboal for diving purposes. If your’e looking for a nicer beach, book a resort at White Beach instead. Only 7 km to the north of Panagsama, this area is also called Basdako which means ‘Big Sand’. The beach is also a great place for snorkeling since there are beautiful coral reefs everywhere. This area is more remote and only has a few resorts, so prices are more than double than those of Panagsama. This area is perfect for couples, families and people who just want to stay away from the noise and crowd of Pangasama. If you rent a motorbike (350P a day through the resort) – you are only 10 minutes drive from the nightlife venues anyway. Since White Beach is quite popular among locals, try and avoid bookings in weekends if possible, to enjoy a quieter experience. Local holidays can be even worse, with thousands of local tourists flooding this beach. Bus : Bus from Cebu takes 3-4 hours. From Dumaguete, ferry+bus could take anywhere between 2.5 and 4 hours. Best time to visit : Same as other Cebu locations – best to visit between January and June. The Pescador island sardine run, Moalboal’s most famous attraction, is available all year round since the shoal doesn’t migrate. Attractions : Scuba diving, snorkeling, sardine run, beach resorts, canyoneering. Extra tips : There’s only one ATM in Panagsama beach and it can be unreliable – so better to bring some cash with you. Dive resorts will provide all necessary gear and a guide, which can make your life much easier. From Cebu you can take a bus, rent a private van or a taxi. In any case the ride will take roughly 3 hours. If you want to get there directly from the airport, we can co-ordinate the pickup service with your hotel. Booking this service will cost the same as finding a random taxi, but is obviously safer and more simple. It’s also possible to reach Moalboal from Dumaguete if you plan on stopping there on your way to Cebu. Take a ferry from Sibulan to Lilo-An on Cebu island, then catch a bus to Moalboal from there. The whole trip can be done in 2.5 hours if your’e lucky and time it well. Be sure to ask the bus driver if he’s going to Cebu via Moalboal – so you don’t get on the wrong bus by mistake. We’ll give you a short introduction to Moalboal’s most popular tourist spots and attractions. In case something seems intriguing and you’d like to learn more, don’t hesitate to contact us. Our experts will explain everything and help you figure out what activities are the best for you. You can book each of these individually, and we’ll help you organize your day tour from Cebu or Dumaguaete. Alternatively, add as many items as you’d like and create your own personal Moalboal package. We’ll then review your order and help you build a complete itinerary. Pescador island is only 10-15 minutes away from Panagsama by boat. While it’s a small, uninhabited island with not much to see on its surface, underwater is a whole different story. Pescador is a scuba diving and snorkeling heaven, as its marine sanctuary is home to a large assortment of marine life. To enjoy Pescador to the fullest, it’s much better to dive and not limit yourself to just snorkeling. 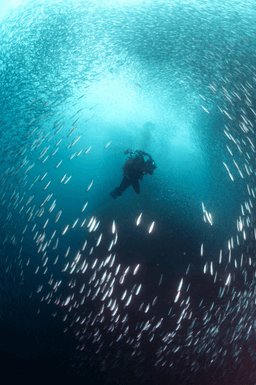 You’ll get to see much more that way, most notably the famous sardine run. Swimming with millions of sardines is really a once in a lifetime experience, and Pescador is the only place in the Philippines to do so. The huge shoal also attracts many other fish and marine mammals, creating a unique ecosystem revolving around it. While diving here, you are extremely likely to come face to face with dolphins, sea turtles and even whale sharks. It’s a fun packed experience, which can be easily combined with some time at the beach, or visiting the Talisay turtle sanctuary for example. 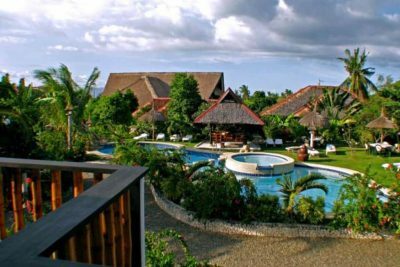 Most Panagsama resorts will be happy to help you organize this day tour – all you need to do is make sure you book the appropriate hotel. Scuba gear and a diving instructor are provided, so you are guaranteed to have a safe and enjoyable adventure. Standard island hopping tour goes out with a motorboat which is good for 6 to 8 people. The price of the boat is 60 USD which is divided between all group members. On top of that, you’ll have to each pay 12$ for snorkel gear, lunch and the tour guide. Special requests and custom itineraries are also available. For bookings, please inquire with us and we’ll help build your island hopping tour. It’s certainly possible to go diving at Pescador island as a day tour from Cebu city as well. If you choose to do so, we highly recommend booking everything in advance and taking a private van instead of a bus to Moalboal. Your itinerary will be tight as it is, so it’s not a good idea to waste time with buses or with trying to find a decent diving center once you get there. 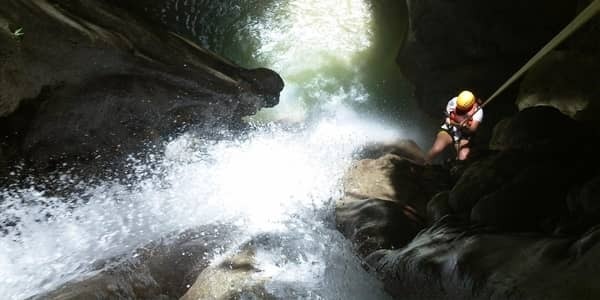 Canyoneering is an extreme sport which has become increasingly popular over the last few years. It basically means going downstream through a canyon by any means necessary – rappelling, walking, swimming and more. The trek typically ends at a waterfall or other scenic location, providing a great reward for your efforts. Moalboal is the jumping point to 2 of the most exciting canyoneering trips in the country. The most popular option is trekking down the Kanlaob river until you make your way to Kawasan Falls. This tour isn’t too challenging, and offers a unique way of reaching the famous waterfalls. Kawasan Falls are among the most beautiful in the Philippines, so paying them a visit is highly recommended. A more challenging option is the trek to Montaneza Falls. Located in the town of Malabuyoc, an hour away from Moalboal, these waterfalls are stunning. While they are less impressive than Kawasan Falls, the trip itself is more exciting. The highlight of the tour is descending the 30m high waterfall into the pool below. The tour ends with a visit to the nearby hot springs – a perfect way to unwind after a grueling day. For a complete list of all available canyoneering tours, along with detailed itineraries and prices, visit our Molaboal canyoneering page. Add any tour to your inquiry and we’ll make sure it’s incorporated into your Moalboal package. Both tours are of moderate difficulty, and take a full day to complete. No swimming skills are required, all you need is a fun-seeking mindset. You’ll be escorted by professional guides, so everything is perfectly safe. While more expansive, we strongly encourage you to book these tours through us – so you’ll enjoy the best guides and equipment. Booking a local guide can be as cheap as 30$ per person, but that’s also the quality you’ll get in return. We believe your safety is the most important thing – so we only work with experienced tour operators who adhere to the highest standards. Canyoneering tours are much better done directly from Moalboal since you’ll need to start early in the morning. We’ll pick you up from your hotel, and after a quick safety briefing you’ll be taken to the starting point of your tour. If you wish to visit the Kawasan Falls from Cebu, it’s better to drop the canyoneering and just head directly to the falls by booking our Kawasan Falls day tour instead. How Does Moalboal Fit Into My Travel Plan? Both Kawasan Falls and Pescador Island are amazing and you should really do everything you can to not miss them. If you are ambitious enough, it’s possible to squeeze both into a day tour from Cebu city. 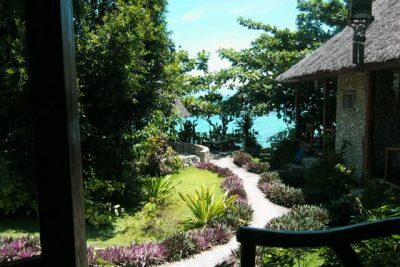 It’s not ideal though, and recommended only in case you have limited time to spend in the Cebu province. 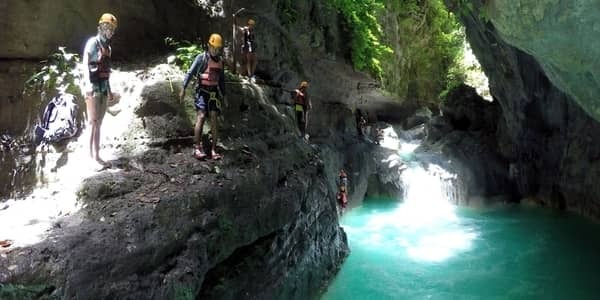 you’ll also won’t be able to take the canyoneering tour – one of the most fun and unique attractions in the Philippines. Spend a few days in Moalboal and explore it properly, so you can truly discover everything it has to offer. Our agents will help plan your time in the most efficient way, and build your whole Moalboal itinerary. All you have to do is add Moalboal to your Cebu package, and let us take care of the rest. 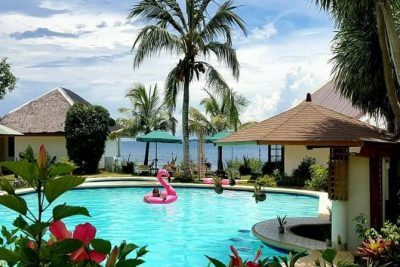 This package could also be combined with other interesting locations nearby, such as Oslob, Bohol or Dumaguete for example. I would like to know how much is the day trip for 2 adults on March 13. We are going to stay at The Lighthouse Resort in Oslob and the pick up from the hotel is included? Are you reffering to the Canyoneering tour or what exactly? Yes, hotel pickup is included but it’ll make the tour price go up obviously. It would be best if you contact us directly and we’ll help you sort everything out. Hi I would like to inquire if you have a day tour package and pickup/drop off from/to airport? Yes we do offer that. Kindly fill out our inquiry form and we’ll send you all the relevant quotes.